The Bulova Vantage Tabletop Clock has a Black stained solid wood base and top with a high gloss finish. 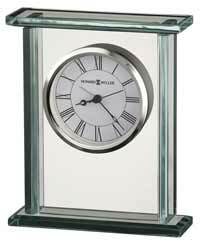 The Contemporary glass case allows you to see the clock moving from all four sides. The hinged rear door allows easy access to the battery compartment. 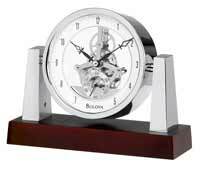 It Features a chrome-finished metal skeleton movement with an independent seconds dial. 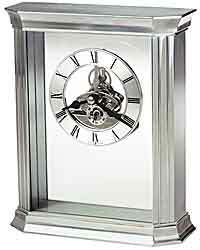 The accurate quartz battery operated movement triggers the working bell on top of the movement. As the hands pass 10 till the hour you can watch the hammer move slowly backward in preparation for the hour strike. The clock strikes once on the hour. 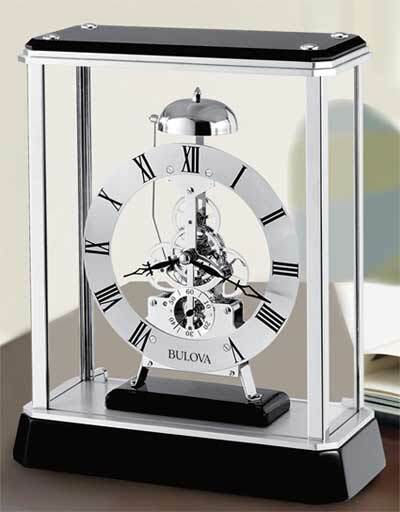 The Aluminum dial has black Roman numerals and black Spade hands that stand out and make the clock easier to read from across the room. Requires 1 AA Battery. 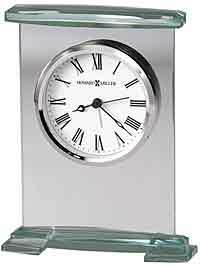 Size: H: 10" W: 8" D: 4.25"
Clocks for sale at The Clock Depot including the B2023 at discount prices.